44 Caliber Bullets For Sale, 265 Grain HP FTX. Revolutionizing lever action guns, the Flex Tip (FTX) creates a higher level of performance for these popular rifles. These are safe to load into tubular magazines, so you can now harness the power, performance and accuracy with you favorite lever action rifle. 1. Polymer Flex Tip design, compresses the hollow point to create immediate expansion, and safe for tubular magazines. 2. Ring Interlock to lock core and jacket togther. 3. Secant Ogive design which is ballistically efficient, delivering flat trajectories, stability, and amazing accuracy. 4. Engineered jacket covering the shank of the bullet with a heavy jacket which controls expansion and enhances accuracy. 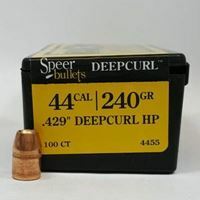 100 pk 44 Caliber 240 HP Speer Bullets. Free Shipping.